I’m back! As I write this, my new son, Calvin, is screaming his brains out in the other room. He’s actually a pretty calm baby most of the time. He must know I’m trying to get back to work. Thanks for your patience while I took the month of August off. Enjoy this gem from Parry Gripp. There is one small song left after this, but this is the last big one in the story, so savor it! When Malachai decided there was a giant ball of disease hidden inside the sun, I decided the best representation of that would be a little homage to Mad Balls, one of my favorite toys in the 80’s. I remember all the gross out 80’s toys with fondness. Garbage Pail Kids, My Pet Monster, Mad Balls… what else? I would like to start a definitive list in the comments. Oh yeah, GAK! I’m excited about next week’s song and page. I’ve read some of Parry’s lyrics and they are hilarious. See you then! Remember when Axe Cop got trapped in a video game called Birds of Prey? If you beat that game, you know how he escaped and why he is on fire. It all fits into the story. -Use right, left and spacebar to eventually turn and bite the birds. -You must hit spacebar one more time after they fly off, at just the right moment. The victory song is so awesome, I want everyone to experience it. Beating the game only takes a few minutes if you know what you are doing. I’m just going to say right now, we have something pretty cool planned for next week. Not just a song, but something else. Something we have never done before. Patreon members got a sneak peek today. If you follow my Bearmageddon page on Facebook, you may have seen the recent influx of bear memes. Or you may have seen them elsewhere, they are sort of exploding right now. I put some more bear related stuff up in the store. Also, I may have already mentioned it, but we are converting Bearmageddon to mobile format for Tapas, Tabulit and Webtoon. Download the app or click the links below. If you have never read Bearmageddon, now is a great time to start. This is a great format and really fun to read this way. 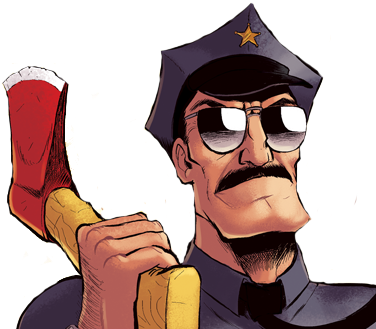 You can also find Axe Cop comics on Tabulit. We plan on converting Axe Cop to this format eventually as well. Next week is a big surprise! See you then. 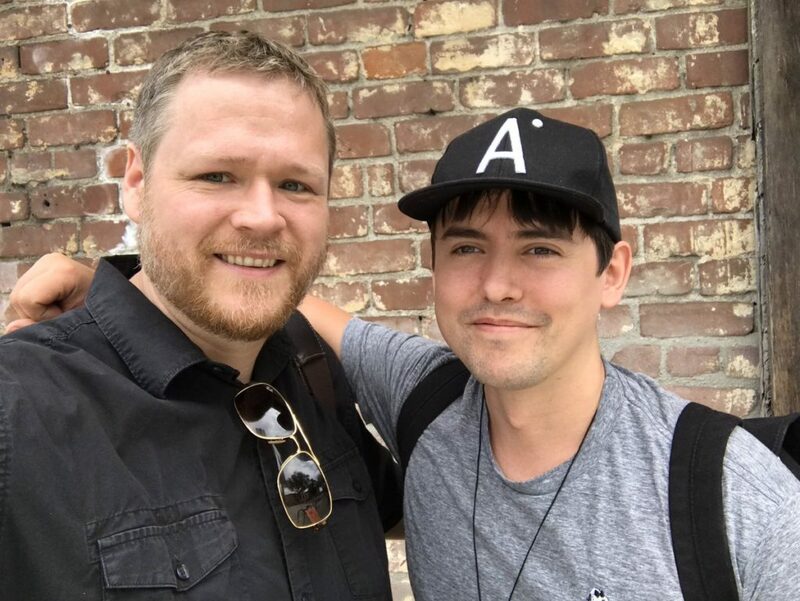 This week I had an amazing lunch with the amazing David Sandberg of Kung Fury. There was a lot of mutual admiration in the air. I think both of us were wondering why we’d not connected sooner. I posted a little video message from the two of us to my Patreon page and I’ll talk more about the meeting in my next Patreon Pipe n’ Type on Friday. Sale on commissions is live until May 12th, my anniversary. Your commission money will go towards a gift I’d like to get my wife, but we’re on a tight budget right now so I’m trying to generate some extra cashflow. I’m also be doing a limited number of digital commissions each month. If you’ve ever wanted me to draw you something, now’s the time! And if you are one of my Patreon subscribers, be sure to get a discount code based on your pledge level from me first! Have you ever read my other comic, Bearmageddon? I’ve been reformatting it for Tapastic and Webtoons. Click those links to read the comic in a very mobile-friendly format. It’s a fun, cinematic way to read because each panel is hidden until you scroll down. Also, if you enjoy Bearmageddon, please give it a vote on Top Webcomics. I’m working on getting Axe Cop on there as well, but one thing at a time. That’s all for this week! Thanks for joining, see you next time. I tell Parry to make a quick, simple little jingle for this page and he makes a full on metal song about steam. So great! This week something really awesome happened to Dave DeAndrea. You should know Dave as the original voice of Axe Cop on YouTube and in the motion comics. He also sang as Axe Cop on last week’s song, Foxes the Size of Couches. But it was his voice work on the Battleship game that got the attention of Rhett and Link. He was on their show Ear Biscuits last week and it was hilarious. 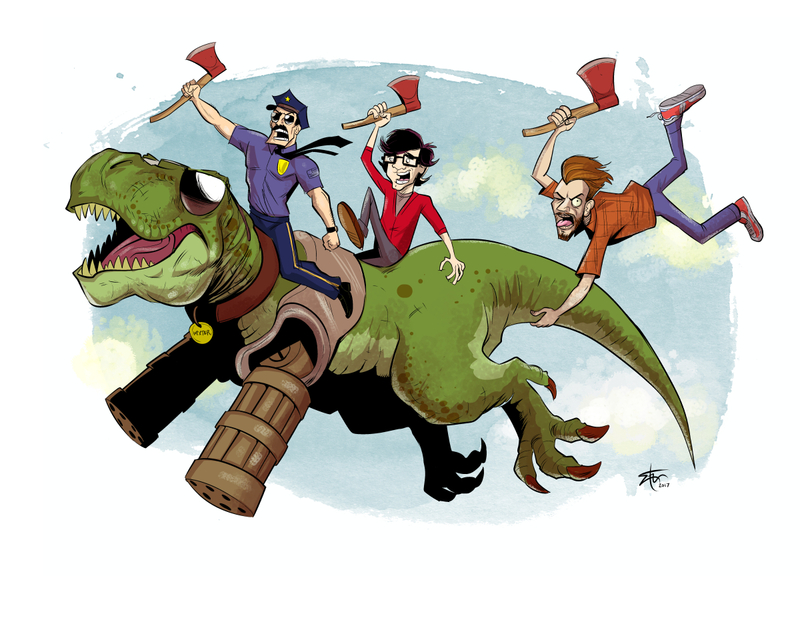 Dave and I heard Rhett and Link were fans of Axe Cop, so I sent Dave along with this drawing of them on Axe Cop’s team. While we are on the topic of me drawing stuff for people. I have decide to open up commissions for the rest of April. I’m only taking 20 orders, closing on May 1st. I’ll also be doing a limited number of digital commissions (much like the one above) each month. If you’ve ever wanted me to draw you something, now’s the time! And if you are one of my Patreon subscribers, be sure to get a discount code from me first! Next week: Axe Cop sings. I haven’ heard it yet, but I’m pretty excited. I’m down to just a few of these prints left. They are hand-printed and hand-detailed, signed and numbered. Thanks for reading! New song next week. The Songster isn’t afraid to genre-jump midset. He is, afterall, the Songster, not the rockster or the R&Bster. Funfact: in today’s song the banjo solo is played by me. I recorded it on my phone and sent it to Parry. My wife got me a banjo for Christmas so I have been playing it for a few months. This is my first time playing, or recording publicly. I love playing banjo and it is coming a lot more naturally to me than expected, though I have a long way to go. I’m no Scruggs. Read the next page, get all my pages in high res and more on Patreon starting at only $2/month. In other news… I think I am going to stop producing Ask Axe Cop episodes, at least until I finish this story. I am doing too much right now. Doing so many different projects I am not finishing any of them. Songster pages will keep coming out on Thursdays and Bearmageddon always comes out on Wednesdays. Well, there is no song on this page, but it’s coming. Next week I will be taking off because I’m in Oregon. In fact tonight is my event at the Egyptian Theater in Coos Bay! I’m on vacation, so I’m not gonna write any more. Thanks for reading! Hear the full song here. The Songster prints are here! These are hand screen printed, 16×20. I hand-detail each one. See the video below. Because I am doing work on every print, I am lowering the availability of these to 50. I have already sold a good amount but if you want yours, get them while they last! If you are anywhere near the small town of Coos Bay, Oregon on the 16th of March, stop by the Egyptian Theater. This is my home town and I will be having Axe Cop Night, where I will do a little presentation about creating Axe Cop and showing 6-8 of my favorite episodes. Huge thanks to Parry Gripp for making such sweet music for this project. I can’t wait until it is all done and we have the coolest comic/album ever. Also, there is a private Facebook group where I check in every week, have a pipe and a chat about what’s been going on, answer questions and generally get to know you guys. Try it for $5/month and see if you find it worth it. If you do a month and didn’t enjoy it, send me an email and I will refund your money.